On Day M, I come to OK Divers quite nervous. Sometimes I’m sea sick on the boat and the trip to Manta Point from Padangbai takes about 50 minutes. "Laci, how many motion sickness pills I need to swallow if I don’t want to vomit all the way?" One should do it, but please calm down, the weather is great, you will be okay." I swallow one pill and I pray for it to work. Vitek, our Czech diving instructor, drags me from my semi-spiritual disposition. "Lila, this is your first Manta point trip, isn’t it? Don’t you wanna take my GoPro and take a few pics? "" Vitek, I would like to, but with my luck and skills I will definitely lose or destroy it. I'll give it to Laci, maybe he can take some pictures during the dives, thank you." On the boat, I meet my diving buddies Christian and Ankea. I find that Ankea has seven dives so far and she does not feel very self-confident underwater yet, so I assure her that we are perfect buddies, because with my twelve dives I’m not self-confident either. The boat trip to Nusa Penida is just amazing. First we have a view of Gunung Agung, which is for once not hidden in the clouds (that’s really unusual and most stunning). About halfway to Penida Island, wild dolphins join us for a while. When we sail between the islands of Lembongan and Penida, all that beauty makes me speechless. While watching the cliffs, the bays, the nature, I notice a lonely fisherman sitting on a stone protrusion in the middle of one of the cliffs. For the rest of the way to Manta Point, my brain is trying to figure out how he got there, because there was no way. My thoughts are interrupted by Laci, who gives us briefing and instructions before the dive. When we are all ready, we do a back-roll into the sea and slowly descend. Manta Point is generally a shallower location and you don’t have to descend too deep. 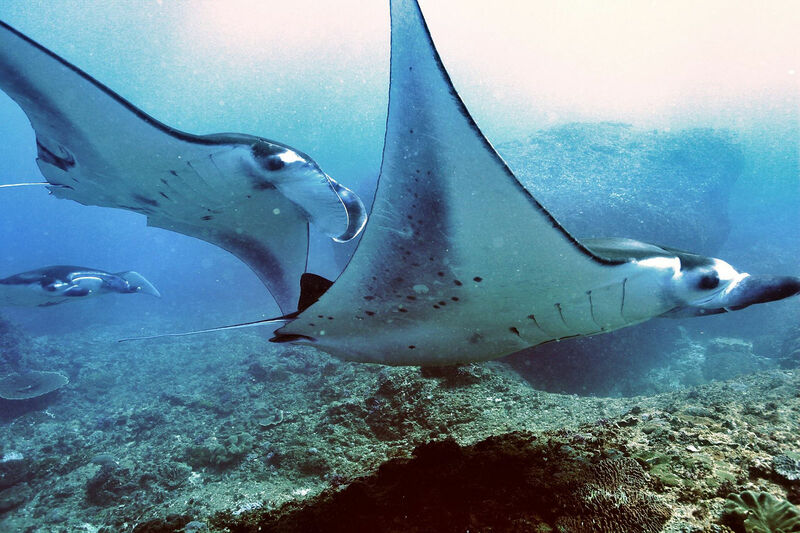 Mantas can be seen even at a depth of 3 meters, so snorkelers can see them too if the visibility is good enough. Laci leads us to a big rock at the location, where most of the mantas usually hang around. Today the visibility is not the best, but a big rock begins to appear in front us. Laci signals to other divers asking if they saw mantas by the rock. They answer yes, so we turn on “the turbo boost” and try to get to the rock as fast as possible. But when we reach the rock, I feel disappointed, because I don’t see any mantas, just a bunch of divers hypnotizing the rock. "This is so typical, Olivia finally got to Manta point and mantas are not here," I begin to fall into a pessimistic mood. I stare at the rock for about two minutes. When I get bored shift my attention to corals and some small fish, Ankea pokes me and I see that something is getting closer to us from the rocks, something that reminds me of Aladdin’s magic carpet. It’s a Manta! A rather big Manta. Its movement fascinates me. As it slowly floats in the space, another manta appears behind and together they perform their dance. It's a beautiful sight, the world cease to exist for me for a while, I’m focusing only on mantas and their movements. I would like to swim closer to them, but I don’t want to disturb their space or to scare them away. One of the mantas (as if reading my thoughts) suddenly turns to me and comes my direction. I'm in shock for a while and I don’t know what to do, I don’t want to crash into her and hurt her, but then I experience one of the most beautiful moments in my life. The manta just flies by above my head in all its beauty. I don’t know if you've ever seen the Free Willy movie, but I can compare my feelings to a cult scene from this movie- a little boy frees the orca from captivity and the orca jumps out of the water and literally flies over him, and the little boy is so happy. So I’m just like him at the moment - a happy little boy. When the manta swims away, I look at Ankea and Christian and we start dancing together "a festive dance", that’s how happy we are. We didn’t expect to see a manta from such a short distance. My eyes find Laci and I see that he has Vitek's GoPro in his hands, so I hope he managed to take at least one photo of the manta for a memory. and yes, that this fish is really strange looking. I’m watching an odd fin that comes out of the water and I ask Ben how it is possible that my OWD-level eyes have come to such a sighting, if Mola Mola occurs mostly at depths too big for me as an Open Water Diver. I thought my chance to spot even the odd fin was about 0.00000000000001 %. Ben tells me that Molas come to the surface to sunbathe, just as we are right now. The odd fin disappears and all the divers on board can’t wait for the end of the mandatory surface interval, hoping to see the Mola underwater. It is the end of October, for many divers it is therefore the last chance for a long time to see Mola. We are slowly descending to 18 meters, but see no Mola at all. Instead, however, we see large schools of small and bigger fish and the corals colored in pink, orange, brown and purple. This site is not only beautiful but also comfortable. Diving here is kind of relaxing because you swim with the current (so called drift diving) so you can enjoy the beauty of the underwater world without exhausting physical activity. We have no luck for Mola this time, but when we're back on the boat, we agree we've had more luck than many divers with hundreds of dives that have not even seen the odd fin on the surface. Next year, I will find you, Mola!